Don’t miss out on the summer CSA program at Oakhill. 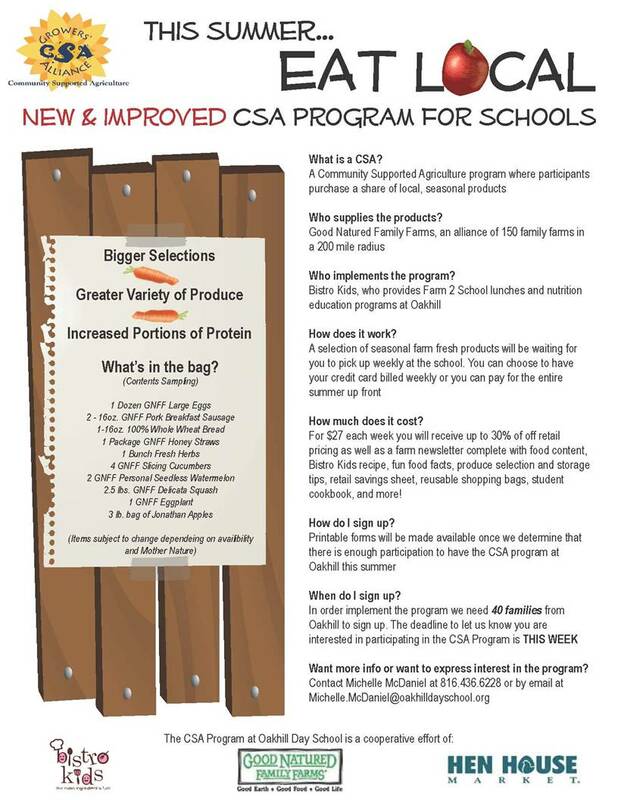 Don’t miss out on this summers CSA program. Our very own Chef Mark sat down with students from Oakhill Day School and spent some time teaching the children about the joys of cooking and what they are fixing and eating. Bistro kids is not just about fixing lunch for the students. We are about teaching them what’s good about fixing and eating good food that helps their bodies grow! Way to go Mark! The students loved had a great time and you included our main ingredient………..FUN! A few days ago, Chef Mark decided to have a “bobbing for apples” contest at Oakhill. No clear winner was determined, but there were plenty of smiles, giggles and laughter to go around, proving that Our main ingredient was part of the day……FUN! How much does it cost? For $22 each week you will receive up to 30% of off retail pricing as well as a farm newsletter complete with food content, Bistro Kids recipe, fun food facts, produce selection and storage tips, retail savings sheet, reusable shopping bags, student cookbook, and more! I understand that my Community Supported Agriculture package will cost $22 each week to run June 2-September 29, 2010. Payment for each package will be paid in full by check or credit card prior to program start, or authorized for weekly credit card deduction. Thank you for supporting local, family farms! Oakhill rocks the Food Revolution! GLADSTONE, MO—Oakhill Day School, a Private Independent School in the Northland, has had its own “Food Revolution” since Fall 2007, with a school garden, recycling and composting program, physical education 5 times a day and has been the pilot school for the Farm to School Lunch Program with Bistro Kids. The students at Oakhill planted in the school garden in early April, and will be one of its local organic farmers for the lunch and cooking program. The students are growing different kinds of lettuce, spinach, radishes, onions and beets from seeds. The school is watering the garden from recycled rain water that is stored in rain barrels near the garden. The students understand why it is necessary to recycle the everyday materials that are used. Some of Oakhill’s middle school students are part of the Green Team, taking recyclable materials out to the recycle bins located on the school’s campus. They, also, empty the compost into the bins where it will become fertilizer for the school garden. Every student at Oakhill gets an hour of physical activity every day they attend school. The students attend Physical Education daily, running through obstacle courses, circuit training, and learning team sports and about healthy lifestyles. They also have outside recess time. This summer, Oakhill will continue to grow its partnership with Bistro Kids through the Community Supported Agriculture Program. Families will be able to purchase farm fresh products through the program for $20 and pick them up at the school. Each week the program will highlight different foods for 30% off of the retail price and receive a farm newsletter, Fun Food Facts and Recipes, produce selection and storage tips, retail savings sheets, reusable shopping bags, a student cookbook and more. CSA encourages families to eat organic, hormone free and locally grown- just as the Farm to School lunch program does. For more information about Oakhill Day School, please call Leah Schembri at (816) 436-6228 or visit www.oakhilldayschool.org. Here’s another example of what we serve to our customers on a daily basis…..again….IT’S THE NORfM! 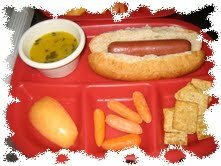 I know that when I was a student, knowing what was in our school lunch was sometimes a mystery. Here’s a few pictures from a couple of days of serving lunch to our customers at Oakhill Day School. Keep in mind….this isn’t the exception, IT’S THE NORM!